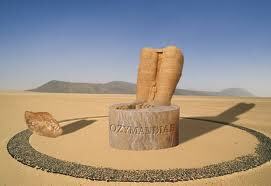 Ozymandias Research Papers discuss a poem by Percy Bysshe Shelley about a horrible past that has left a desert behind. Percy Bysshe Shelley, an English Romantic poet, published the poem Ozymandias in 1818. A fourteen-line sonnet, Ozymadias has a traditional rhyme scheme, yet its name and subject matter are dark and exotic in nature. The use of imagery and symbolism in this poem give it this exotic quality, while Shelley's use of irony creates a sense of mystery and intrigue. This discussion will demonstrate that by using symbolism and irony, Shelley has transformed a lyrical sonnet into a powerful creation that is both universal and charged moral, social and political meaning. The poem begins in the first person and recounts a traveler's story that describes "two vast trunkless legs of stone" in the desert, and an inscription that reads, "My name is Ozymandias, king of kings: Look on my works ye mighty and despair!" . The poem ends by describing a scene in which nothing remains except the trunkless stone legs and pedestal with the inscription. This poem describes a horrible past that has left a desert behind. There are few remnants of this past, but they symbolize a lack of culture and imply a sense of tyranny by the once-great ruler, Ozymandias. The desert symbolizes the character of nature, which has the power to reclaim any land, no matter how strong the nation that once lived there may have been. The trunkless legs of stone symbolize a kingdom that was unable to move and unable to support its population. The poem generally also symbolizes the disaster of tyranny, with its inevitable destruction under the sands of time. In this sense, some critics view the desert as performing the operation that should have been completed by social reform. In addition, the poem symbolizes tyranny's affects upon nature. That is, when there is no culture to support the people, nature will take over. But because tyranny has separated culture from nature, even the natural consequence is unfruitful. As the poem's last line states, "the lone and level sands stretch far and away," symbolizing loneliness and desolation in every direction. The ironic nature of the poem is found in Ozymandias's statement that he is king of kings, and advise to others to look on his works in despair. It is ironic that a king should be in despair and unable to avoid such consequences. In addition, it is also ironic in that the consequence of tyranny becomes a lesson in democracy. Paper Masters writes custom research papers on Ozymandias and discuss a poem by Percy Bysshe Shelley about a horrible past that has left a desert behind.